While drug cases are serious regardless of which system they end up in, federal prosecutions are almost always more serious than a case in state court. Don’t leave your future and your freedom to chance by entrusting your case to just anyone. It is in your best interest to work with an experienced federal defense lawyer. Getting arrested on a drug-related charge can be a confusing experience. One of the first questions people tend to ask is whether their drug case will end up in state or federal court. Understandably, many people don’t understand why a drug case goes to state court versus federal court. There are many factors that can play a role in determining which system handles a drug case. If you have been arrested for a drug-related crime of any kind, it is important to work with an experienced Texas criminal defense lawyer. A drug-related conviction can result in serious consequences, including a lengthy prison sentence, monetary penalties, and a loss of your freedom and reputation. Drug offenses are one of the most common crimes in the United States. In 2015 alone, state and federal law enforcement officials arrested over 1.4 million people on drug-related charges. Out of these arrests, more than 500,000 involved violent crimes, which typically means a drug offense in which the accused use a weapon, force, or the threat of force while carrying out the crime. In some cases, the federal court system has sole jurisdiction over a drug case. In other cases, the case could end up in state or federal court. Which system a case goes to depends on several factors. Arrests made by federal authorities – If a federal law enforcement agency, such as the Drug Enforcement Agency (DEA), makes the arrest, the case will likely be prosecuted in federal court. Federal agencies typically have more resources and personnel available to investigate a case — especially complex cases that involve many individuals spread out over a large area. Drug crimes on federal property – In some cases, drug-related offenses are carried out on federal property. For example, if an individual is caught with drugs in a federal park, this would most likely involve a federal prosecution, even if the amount of drugs was relatively small. Federal and state authorities decide – It is also possible for state and federal authorities to confer with each other and decide which system should handle a drug-related prosecution. In some cases, state law enforcement authorities refer a case to federal prosecutors. Crime involves interstate commerce – When crimes cross state lines, the prosecution typically takes place in the federal system. The rise of the internet has led to an increase in prosecutions in federal court. For example, a drug dealer who emails information or makes contacts with buyers in other states over the internet may face prosecution in federal court, even if the dealer never physically crossed the state line. Serious drug charges – The more serious a drug charge is, the more likely it is for the case to end up in federal court. For example, a complex case involving the manufacture of large amounts of drugs is more likely to be handled by federal prosecutors. 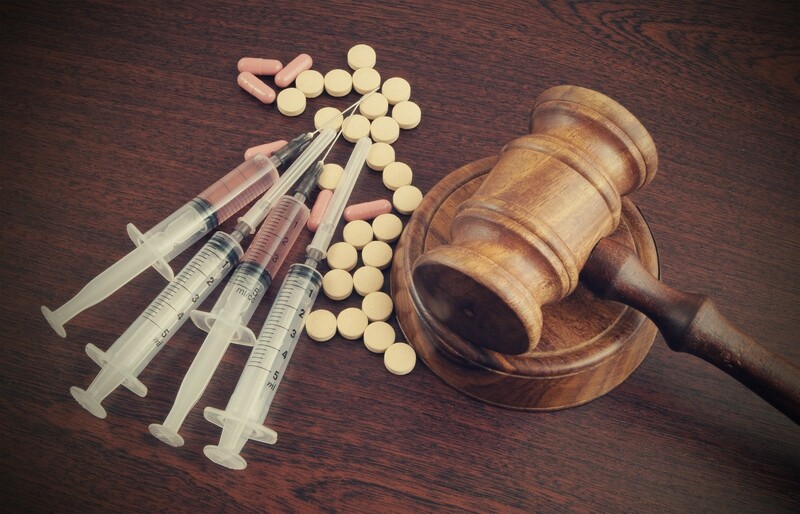 Drug possession vs. drug trafficking – While it’s not impossible for a drug possession case to go to federal court, it is more usual to see a drug possession charge prosecuted in the state system. If a person is arrested for drug trafficking, however, it is more likely for that type of case to end up in federal court. In many cases, federal prosecutors try to break up drug trafficking enterprises, which means they try to cast as wide a net as possible when pursuing charges against individuals involved in drug trafficking. These tend to be very large cases that can involve many different defendants. Whether a drug case goes to state or federal court can be something of a gray area. This is why it’s important for individuals accused of drug-related crimes to work with a knowledgeable criminal defense lawyer. While drug cases are serious regardless of which system they end up in, federal prosecutions are almost always more serious than a case in state court. One of the main things that makes federal court more serious than state court is the likelihood of a harsh sentence. In federal court, defendants are subject to the Federal Sentencing Guidelines. These guidelines can result in courts imposing harsher prison sentences and other penalties than an individual might face in state court. It’s also worth noting that federal courts tend to handle more serious drug cases, which is another reason why the penalties in federal drug cases tend to be more severe than those in state court. Federal court is much different than state court. If you are facing prosecution in federal court, or you are appealing a case in the federal system, it is critical to work with a lawyer who regularly handles federal cases. Don’t leave your future and your freedom to chance by entrusting your case to just anyone. It is in your best interest to work with an experienced federal defense lawyer.